Xcode 3.2 added the ability to rename projects. Choose Project > Rename Project. Xcode is set to rename all files in the project that are based on the project name: project file, targets, build products (application name is an example), precompiled headers, and property lists. If you want to keep the old name for some files, deselect the checkbox in the left column. Wow, that is easier, I’ve been opening the (pxuser?) 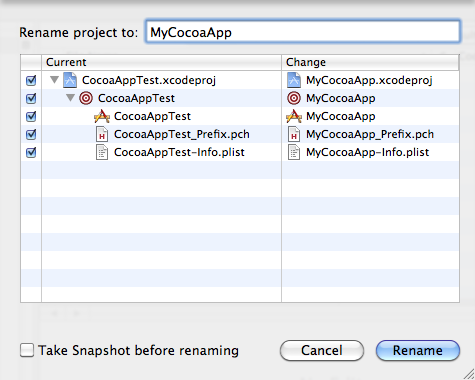 file in MyCocoaApp.xcodeproject, using find and replace, and then renaming each file in Finder. The latest versions of Xcode really have been getting more awesome. On a tangent, do you find any speed improvement from using precompiled headers? I just changed a project the other day to use a pch and I can’t see any difference. I assume pch would be faster but I really can’t tell. I have not tested the speed improvements of using precompiled headers. My best guess is that the speed improvement is relative to the size of the project. Larger projects with many files would benefit more from precompiled headers than smaller projects would.